Willem Dafoe (born July 22, 1955) is an American film, stage, and voice actor, and a member of the experimental theater company The Wooster Group. Films he appears in include Platoon, Affliction, Off Limits, Streets of Fire, To Live and Die in L.A., Born on the Fourth of July, The English Patient, The Last Temptation of Christ, Mississippi Burning, Mr. Bean’s Holiday, The Life Aquatic with Steve Zissou, The Boondock Saints, Spider-Man, and The Aviator. He has also had voice roles in both Fantastic Mr. Fox and Finding Nemo. 2008 Dust of Time, TheThe Dust of Time A.
Daniel Wymbs: Willem Dafoe is great. Flo McSweeney (actress): will pick the actors I like / admire.. William Dafoe… De Niro… Pacino…. Denzel. Ferdia McAnna (writer): Willem Dafoe started out great in The Loveless, got better and aced Platoon but for me, his finest performance came in To Live and Die in LA. 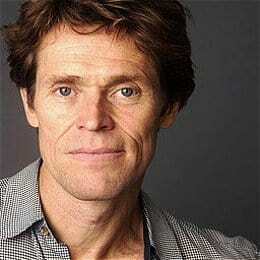 Gemma Doorley (actress): Willem Dafoe! A genius! Love his work with New York theatre company The Wooster Group. Michael Doherty (RTE Guide): Fearless actor who never took the easy option and his career has been the better for it. Dominic Mafham (actor): un pin downable, elusive, intriguing. I want to watch. Alvean Jones (tv presenter): good actor.